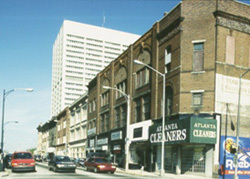 Hotel Row is a single block of historic commercial buildings along Mitchell Street that, when built, was part of Atlanta's original business district, in the shadow of the city's main railroad station. This district is largely unchanged from the beginning of the 20th century. Only the first floor storefronts have been modified. The brick buildings are between three and five stories high with plate glass storefronts and symmetrical facades. Several buildings were built specifically as hotels. Built as a Jewish community center, Concordia Hall is the oldest building within Hotel Row and survived a fire in May 1908 that destroyed the rest of the commercial buildings on this block. The three-story brick building once featured a high Victorian facade with gabled roofs, arched windows crowned with pediments, parapet cornices and a projecting onion dome turret at the southwest corner. Because of alterations in the early 20th century, much of the detailing is gone. 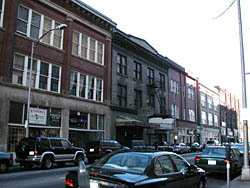 The ground level along Mitchell Street was originally designed for small shops and served as additional income for the Concordia Association. The interior includes five separate shops occuping the street and basement levels and corresponding to the five bays which line the main facade. The second level contains one large open room in the front and smaller rooms facing the back alley. The third level consists of more than 20 guestrooms with private baths. The Gordon Hotel is a three-story, buff-colored brick building featuring three bay windows on the second and third levels, recessed between Ionic pilasters. The street level facade also features stone pilasters with Ionic capitals and a dentillated cornice. A narrow alley runs between the Gordon and the adjacent commercial red brick building. The Scoville Hotel, formerly the Marion Hotel, is a three-story, buff-colored building having four paired windows across the upper levels. Modillions and dentils ornament the heavy cornice line. The interior lobby of the hotel contains some original light fixtures and a crafted wooden front desk. The floor is a black and white checkerboard tile pattern with the name "Scoville" laid in red tile in the front foyer. The commercial building next to the Scoville is a three-story stone, frame and red brick building featuring three window panels recessed between clustered brick piers. The piers support heavy stone lintels beneath a cornice. The Sylvan Hotel is the last building that constitutes Hotel Row. It is a four-story building constructed of buff-colored brick built to house guests and workers of the railroad. Five bays wide, the building now houses retail establishments on the street level. Hotel Row includes 205 through 235 Mitchell St. (odd numbers only). The first floor shops are open during normal business hours.